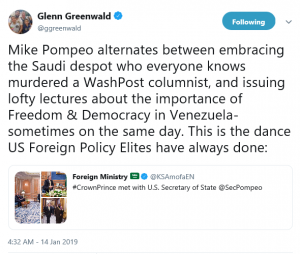 ZCommunications » Was that the Onion or Reuters Quoting Mike Pompeo on Venezuela? The Onion might have simply changed “countries” above to “dictatorships” or, better still, “dictatorships armed by the United States”. A “serious” outlet like Reuters should be able quote a critic of US foreign policy saying something like that in a news article. If that kind of thing were standard practice at major outlets like Reuters, it could literally save millions of lives.